There is evidence that the metabolism of fluorouracil in the anabolic pathway blocks the methylation reaction of deoxyuridylic acid to thymidylic acid. In this manner, fluorouracil interferes with the synthesis of deoxyribonucleic acid (DNA) and to a lesser extent inhibits the formation of ribonucleic acid (RNA). 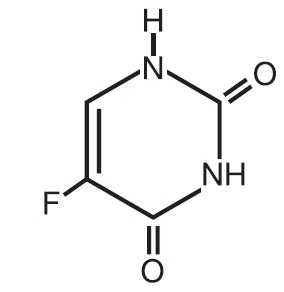 Since DNA and RNA are essential for cell division and growth, the effect of fluorouracil may be to create a thymine deficiency which provokes unbalanced growth and death of the cell. The effects of DNA and RNA deprivation are most marked on those cells which grow more rapidly and take up fluorouracil at a more rapid rate. The catabolic metabolism of fluorouracil results in degradation products (e.g., CO2, urea, Î±-fluoro-Î²-alanine) which are inactive.